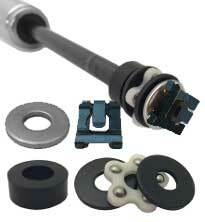 Replacement bearing kit for office chair gas pneumatic cylinders. It's always a good idea to replace these parts anytime a base is removed. Replace or repair worn out or missing attachment hardware on an office chair gas lift cylinder.